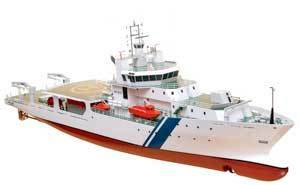 UT517 – Coastguard vessels for the Indian Navy. More and more authorities are specifying Rolls-Royce ship designs and equipment for coastguard and anti-pollution vessels. Maritime states are increasingly aware of threats to their coastlines and exclusive economic zones (EEZ). The nature and seriousness of the threats varies from state to state. They may include fisheries control and prevention of illegal fishing, emergency towing of ships with engine or steering failure which represent a pollution hazard if they drift ashore, and pollution control and clean up should the worst happen. In addition come a host of other coastguard functions. Some countries prefer to split their various coastal protection and EEZ management functions among different types of vessel. One type which has come into prominence focusses on emergency towing, pollution control and oil spill recovery. Over the years, Europe has suffered several major oil spill incidents which have caused grave environmental damage, economic loss and public outcry. The Torrey Canyon and Amoco Cadiz alerted Britain and France to the risks. 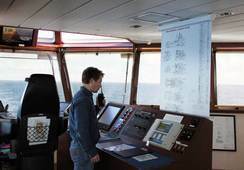 More recently the Braer incident in Shetland and the sinking of the tankers Erica and Prestige off the French and Spanish coasts have also encouraged governments and authorities to have more and better equipment available. The risk is not just from tankers. A few hundred tonnes of heavy bunker fuel can cause havoc along the coastline as the Rocknes and Server incidents in Norway show, and large container ships with large quantities of bunkers are a potential hazard, demonstrated by the MSC Napoli casualty on the Channel coast of England. Rolls-Royce has built up extensive experience in designing and equipping vessels to tackle these various tasks. The ships are stable and efficient working platforms and provide safe and comfortable living conditions for the crew. In each case the design is accompanied by a package of Rolls-Royce equipment and systems. The latest contract to be signed covers the design and equipment for a vessel ordered for the Icelandic coastguard, Landhelgisgæsla Islands. This multipurpose coastguard vessel is to be built by ASMAR in Chile. 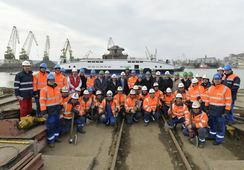 On completion in 2009 it will perform a variety of tasks, including coastguard duties and management of Iceland's exclusive economic zone, fishery control, standby and rescue, emergency towing, pollution prevention, oil recovery and fire fighting. The new ship will replace Odin, one of Iceland's three elderly but much respected existing coastguard vessels. It will have to operate over a very large area in a region with challenging weather conditions. At the same time increased tanker traffic, particularly on the north west Russia to USA route, presents a pollution risk to Iceland's easily damaged coastlines. 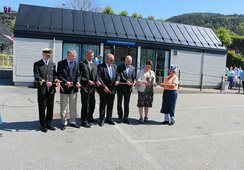 Svein Kleven, chief designer in UT-Design, said: "The starting point for the design was the Norwegian coastguard vessel KV Harstad which is a UT512. This vessel entered service at the beginning of 2005 and has proved very successful. Although the capabilities required of the Icelandic and Norwegian vessels overlap they are not identical, so the new ship for Iceland is 10m longer and also faster. The design has been given the type number UT512L and the ship will have an easily propelled hull with a bulb bow, a long forecastle, a foredeck gun turret, a large wheelhouse set well back from the bow, and a working deck aft. It will have a speed of more than 20 knots and accommodation for 48 people in single and two berth cabins. A bollard pull of about 110 tonnes has been specified so that in emergency the new Icelandic coastguard vessel will be able to tow stricken tankers of up to about 200,000dwt." Rolls-Royce is supplying a package of equipment and systems to go with the design. Two Bergen main engines each rated at 4,500kW will provide the power in a twin screw arrangement with shaft generators on the main gearboxes and CP propellers. Although a substantial bollard pull is needed the high speed requirement made open water propellers the favoured solution. A Rolls-Royce dynamic positioning system will meet the IMO DP1 standard, working in conjunction with a Poscon joystick system to control the engines, propellers, high lift flap rudders with independent steering gear and the four thrusters. The thruster outlet comprises two 450kW tunnel thrusters at the bow together with an 883kW swing up azimuth thruster and there will be a third tunnel thruster installed in the stern skeg. The machinery can be run in several modes, reducing the amount of energy needed to satisfy the vessel's many operating profiles and so minimising the environmental footprint. A comprehensive range of oil booms and skimming equipment enables Don Inda and its sister to clear oil pollution both on the open sea and in more restricted waters. Oil booms can be set out and skimmers deployed to collect oil. In confined waters, two 15m long floating arms can be deployed from the ship's side in a wide vee shape. The vessel moves through the oil spill sweeping oil towards the recovery pumps. An important aspect of these two vessels is the extremely large tank capacity for recovered oil, amounting to about 1,730m3. But compared with other vessels with recovered oil capacity this figure can be multiplied because an oil separation system is built in. Instead of the typical 50:50 mix of recovered oil and water pumped to the tanks, the separator discharges back to the sea water of a cleanliness meeting environmental regulations, so that the tanks are filled with about 95% oil and only 5% water. Recovered oil can be heated for pumping to another vessel or ashore so that in the event of a massive oil spill, the SASEMAR vessels can act as both oil spill recoverers and as pumping vessels. d Kingdom recognised the need for emergency towing and pollution prevention vessels to protect its long coastline. Following extensive studies the emergency towing vessel programme was put into action and Klyne Tugs won an eight year contract to station vessels on standby at key locations. The four broad operating areas are the Channel western approaches, Straits of Dover, Northern Scotland, and the west coast of Scotland. Two of the vessels were purpose built to a Rolls-Royce UT 719 T design derived from the multifunctional UT 719 offshore hull but optimised for the task, with a focus on towing and pollution prevention. Anglian Princess and Anglian Sovereign were built in China by Yantai Raffles and were delivered in 2002 and 2003. Recently Klyne Tugs won a two year extension to their contract from the UK Maritime and Coastguard Agency MCA. through to 2011. Rolls-Royce involvement in coastguard type vessels is not confined to Europe and Scandinavia. In India the first of three coastguard vessels for the Indian Navy is being fitted out at the ABG Shipyard. 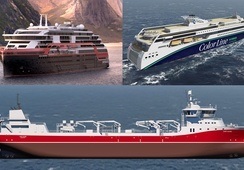 These three ships are specially designed by Rolls-Royce, have the type number UT 517 and the contract includes a full package of Rolls-Royce equipment. Announcing the agreement, the Minister for Transport and Regional Services Warren Truss said: " The ETV Pacific Responder enhances Australia's ability to respond to a shipping incident in this sensitive and important marine environment. The powerful ocean-going vessel is equipped to carry out other first response activities such as search and rescue. It is an important part of the National Maritime Emergency Response Arrangement and will significantly reduce the risks of ship-sourced pollution." Pacific Responder was built by Pan United in Indonesia to the UT 738 design with a Rolls-Royce equipment package. The 64.3m long, 80 tonne bollard pull anchorhandling tug supply vessel has been modified for its new ETV role.